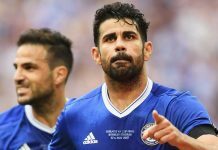 Cahill, Van Persie, Miazga plus more..
Home Features Transfer Centre – Cahill, Van Persie, Miazga plus more.. Transfer Centre – Cahill, Van Persie, Miazga plus more..
As news came in of Ramires’s official departure from the club in a £25 million move to China, the rumour mills have been ticking on. Perhaps the shock of the day was learning that Chelsea have allegedly made an offer according to reputable sources, for MLS defender Matt Miazga from New York Red Balls. Yes, I had the same reaction. But Miazga is apparently subject to an offer from Chelsea and wants to play in England. The 20-year old American International has less than a year remaining on his current contract so his club would sell now for a small fee rather than for free come the end of 2016. So naturally, with this talk of all these new centre back targets, it has apparently unsettled out of favour England International Gary Cahill who according to The Telegraph, is considering his own future and could request to leave. However, it is unlikely that the club will allow him to leave during this window, which could jeprodise his International chances in the summers Euro’s. Finally, perhaps an unrealistic rumour but even still worth reading about. Former Arsenal and Manchester United striker Robin Van Persie is wishing to end his nightmare in Turkey and return to England. A rumour started by The Express, says Manager Guus Hiddink is the driving force behind their interest in his fellow countryman Van Persie and wants to bring him to London. His club however have said, it will take an ‘extraordinary offer’ for them to sell. Previous articleHave Chelsea Been Wasteful With Letting Players Leave? Next articleTransfer Centre – Pato deal delayed & he was previously rejected by QPR, Miazga undergoes medical..